My family decided to do ALL homemade gifts for Christmas this year. I was a little intimidated by this task at first but after seeing all of the inspiration on the internet I feel like I can do this! 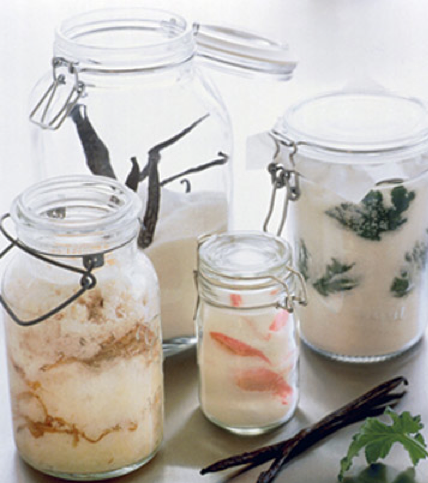 I thought these homemade gift ideas from Martha Stewart were really clever and wanted to share. I think they would be great friend/neighbor gifts or stocking stuffers. Quarters come in handy at the newsstand, campus laundries, and video arcades; transit tokens are appreciated by commuters. 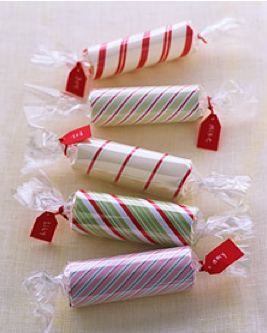 Cover their utilitarian wrappers with candy cane hues. 1. Cut a rectangle of striped wrapping paper on the bias, making it large enough to enclose the roll. Wrap roll, secure overlap with double-sided tape, and fold in ends. Or add decorative stripes with quilling paper (available at crafts or stationery stores): Wrap roll first in plain paper, attach quilling strip with doublesided tape, wind tightly around roll in a spiral motion, and tape end. 2. Wrap decorated rolls in cellophane, twist ends, and attach tags with yarn. You need only four ingredients to make these moisturizing exfoliants. 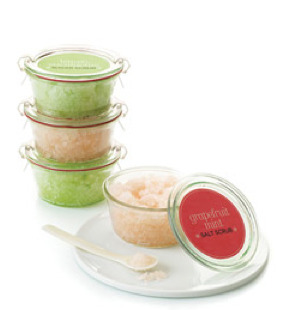 The base can be made from either Epsom salts or sugar, depending on whether you want a large or fine grain. Color the scrubs with shades that are in keeping with some of the scents you use — pink with grapefruit, for example, or green with eucalyptus. Makes about 2 1/3 cups. 1. Stir together Epsom salts or sugar and carrier oil in a bowl, mixing well. 2. Using pipette, add essential oil, 1 drop at a time. Add food coloring, and stir until color is even throughout. Spoon into canning jars. 3. Download clip-art labels, enlarging or reducing to fit top of canning jar if necessary. Print onto ink-jet bumper-sticker paper (which is designed to withstand water). Cut out the labels, and affix to clean jars. soap and yields six bars of soap. 1. Melt the glycerin according to the package instructions, using 1/4 cup at a time. 2. 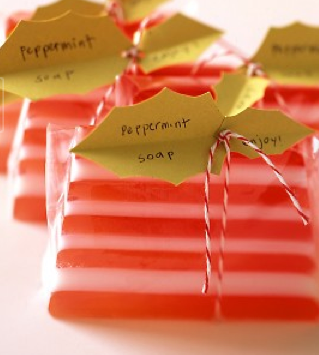 Stir in a drop of peppermint oil (available at most health-food stores) with a plastic spoon; for the clear glycerin, add drops of red food coloring, stirring until you get the desired hue. 3. Pour the 1/4 cup of melted soap into the loaf pan. Let cool for 20 minutes. 4. Score the top with a fork. Repeat, alternating colors, until the pan is full. 5. Let set for 4 hours. Pop soap out of pan, and slice into bars. 6. Wrap each bar in cellophane; tape it shut, and tie with bakery string. 7. Cut holly-leaf tags out of green construction paper. 1. Pull 1 or 2 sequins off the thread to create a lead end. Starting at the top of bead (or foam ball), secure lead end with a dab of glue. 2. 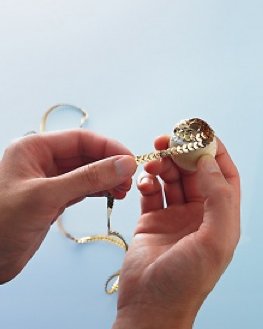 Apply glue one section at a time, and adhere sequin strand, spiraling it tightly and applying pressure as you work. [See image 2 above.] 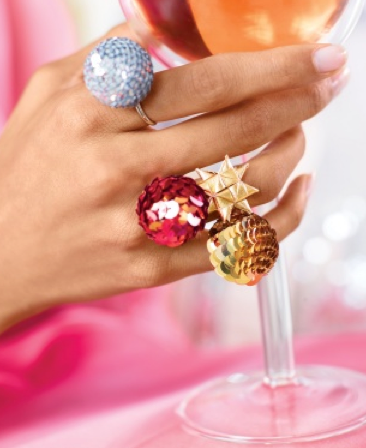 Leave bead holes open if you’ll be stringing them; otherwise, cover with sequins.